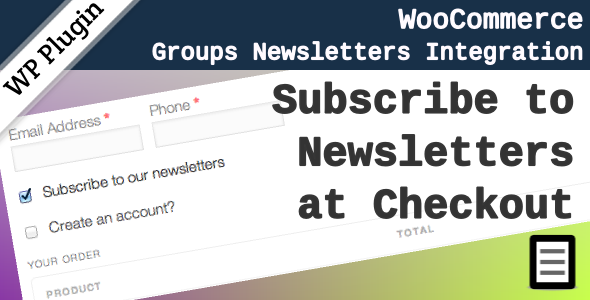 The WooCommerce Groups Newsletters extension lets customers subscribe to newsletters at checkout. This extension requires the Groups Newsletters plugin, which provides a newsletter campaign system for your site without the need to use third-party services. It integrates the system with WooCommerce to let customers subscribe to newsletters at checkout. Please refer to this extension’s documentation pages and the Groups Newsletters documentation pages for details on the newsletter campaign system. I am still struggling to get the subsciption to work. When logging off then entering the shop and placing an order as unregistered customer, I check the subscription checkbox and do the checkout. I get the order confirmation but NOT the subscription confirmation mail. However in the the admin dashboard under Users > All users the new customer has a “Yes” in the Subscriber column. BUT when I go to Newsletters > Subscribers the user is NOT listed there. In general there is a deifference between those two lists: Newsletters > Subscribers does NOT match the Users > All users with the Subscribers=”Yes” value. I am thankful for your work so far but this is a bit confusing and I would appreciate your help. Thank you! The newsletter email is configured correctly and I can send test newsletters around. Yes, what you see is correct. We have two different types of subscribers, those that you can see under Newsletters > Subscribers are the ones that do not have an account, they are just subscribed by email. Subscribers with a user account do not appear in that list, on the Users screen, there is a column labeled ‘Subscriber’ and for those who have a user account and have subscribed to the newsletters you will see a ‘Yes’ in their row. It might be a good idea to include subscribed user accounts under Newsletters > Subscribers, I’ll review this and possibly add it. Kento and Antonio, I’m using a third-party email provider (that is not MailChimp nor any other known player and has no known-integrations). If I understand correctly, with your plugin on CodeCanyon, when either a subscriber or non-subscriber either buys a product or a subscription, on the checkout page he has the option to subscribe to the newsletter? And if he does so, he will be added to a list that shows up on WordPress dashboard? Could I then export this list to my email marketing provider? Hi Jonas, this works together with Groups Newsletters (required) and allows customers to subscribe at checkout. Groups Newsletters maintains a separate list for subscribers without user accounts and this list can be exported. But those who have a user account on the site won’t be included there, you can export users with the Export User Data plugin and add the Groups newsletters subscriber user meta field value to the exported list. Hi, there is no .zip file. Just .php files.. U have an emial i can send the files for you to see? You’re probably using Safari to download the files and under Safari > Preferences > General have enabled ‘Open “safe” files after downloading’. This has the effect of unzipping the plugin zip file right after it is downloaded, that’s why you see the PHP files directly in the extracted plugin folder, instead of the plugin zip file which you would upload. please check your browser settings, or try with another, the file you download is a .zip. I want to integrate this plugin into my woocommerce page. It works well with new/unregistered users BUT whenever a user is already registered he will NOT see the newsletter checkbox on checkout. So all my returning, i.e. registered customers will never notice that there is a newsletter! How can I present the newsletter checkbox to ANY user that is NOT subscribed whether or not he is registered? The option to subscribe to newsletters is presented to customers who haven’t already subscribed. Your returning customers will see the option, those that are already subscribed won’t see it. thanks for your reply. Unfortunately thats not the case. When I order as a registered user, I do NOT see the newsletter checkbox. It only occurs when I am not signed in. I got it. Its the site admin! He won’t ever see the newsletter checkbox. All other users (registered or not) will see it. Thanks for the update Richard, note that if you visit the admin’s profile page (upper right, Edit My Profile) you should see a checkbox labeled ‘Subscribe to our newsletters’ which in the case of your admin would be checked right now. 2. Visit the shop (now as a guest) and add a product to your cart, go to the checkout page. 3. 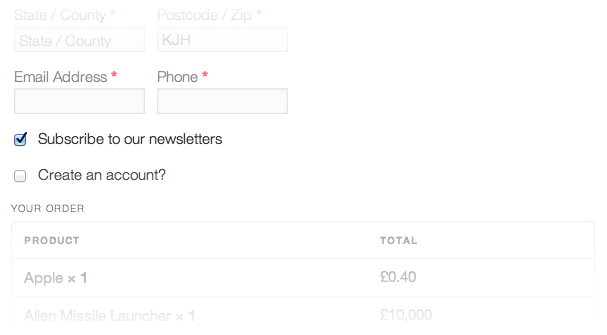 During checkout, create an account and uncheck the subscribe to newsletter box. 5. Your cart should be empty now. Add a new product to the cart and go to checkout again, note that now you are logged in as a customer, you should see the option to subscribe to the newsletter again.